Casual work wear can be a tough dress code to decode. When I get the opportunity to dress casually for the office, my go to is flared jeans paired with a blazer. It looks polished and professional, without being stuffy. For your jeans, I’d stick with darker washes when wearing them to the office. These ones from Express that I’m wearing (linked up below) are perfect! For your blazer, have fun! Because you are pairing your blazer with denim – the ultimate ‘neutral’ – the sky’s the limit when it comes to what blazer you wear. 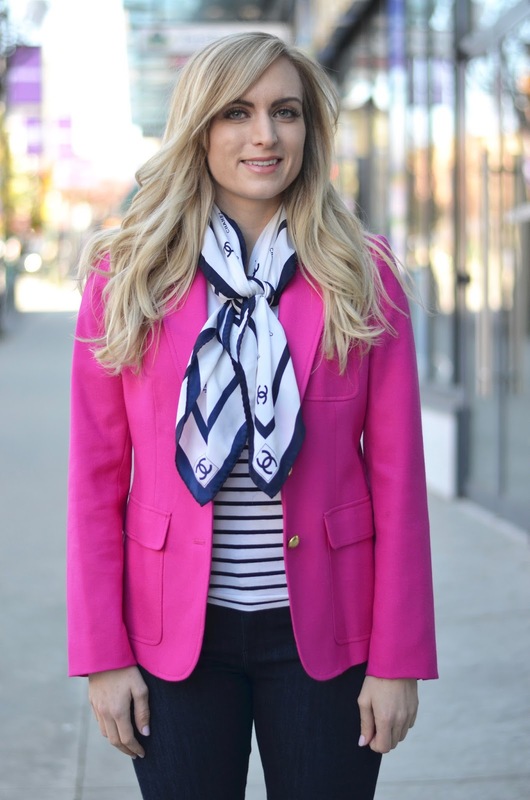 My pink blazer is from JCrew’s spring collection last year. It is hands down one of my favorite blazers. I’ve linked up similar dark pink ones for you to shop below. Scarves are making a huge come back this season – with short ones tied around your neck, or larger ones worn more loosely (like I’ve done here). I actually inherited a number of scarves from grandmother; including this beautiful vintage Chanel one, so you will probably see a fair number of outfits with scarves on the blog this spring/summer! 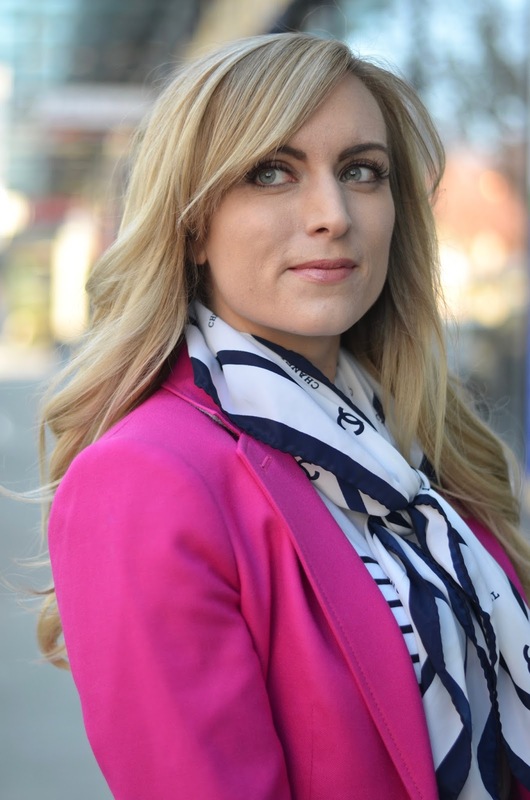 I’ve linked up similar navy & white printed scarves below. In other news, I have been in full-on “update-my-office-and-home-for-spring” mode this week. Anyone else feeling the needed to refresh their home?! I bought new bedding this weekend which I am absolutely in love with (I’ll share it on my instagram later today!) Next project is to get my balcony ready for spring. I want a cozy patio furniture set! "The Best Work Appropriate Lace Top"
Your outfit is really stunning! And haha to be honest im not much of a jeans wearer myself! If something is casual enough (ie not work) that I can wear jeans, I usually opt for leggings instead. But, I've got to say I do love the new flared jeans that are everywhere this spring so I think I'll be wearing them more often! You should definitely check some out! 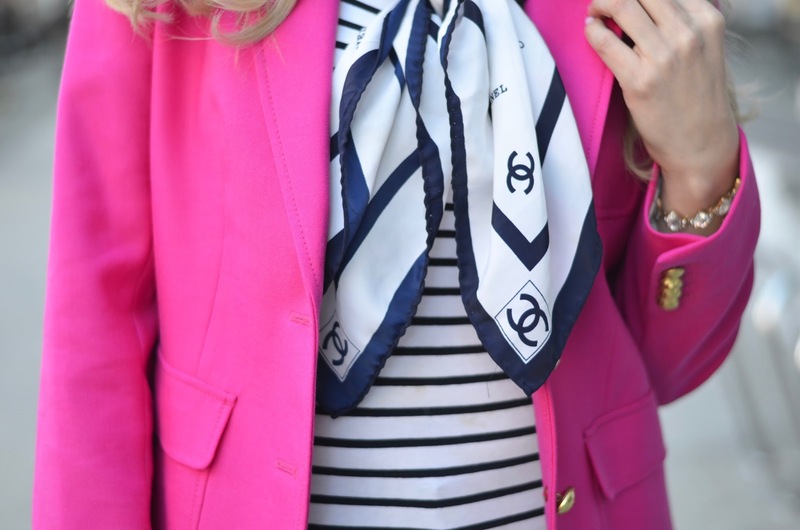 Beautiful in pink and navy look! Love the scarf! Agreed! Theres something very polished about it!